Rubus fruticosa This scrambling shrub is a real must in a wildlife garden. Its leaves are the larval foodplant of several species of moth, its flowers provide nectar and pollen for many insects, it bears fruit in late summer and autumn for birds and small mammals (and us! ), and it offers good cover all year round. It has arching stems armed with hooked thorns that help it to scramble over anything. When the tip of a stem droops to the ground, it takes root, sending up a new plant. 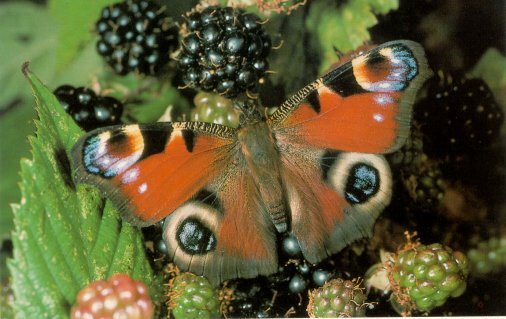 Brambles thrive in most soils and seem happy to grow in the sun or in partial or full shade. This wild Blackberry has smaller, but much tastier berries than the cultivated kind usually sold to gardeners.It can be invasive so needs regular pruning to keep it in check.Flowers from May to September, fruits from August to October. Plants will be sent as bare-roots dug up directly from our field hedges as wild brambles do not grow at all well confined in pots. They will soon grow away once planted and watered regularly until established.